Fox’ Bar & Restaurant Review: Malagamba, 2 Stefan Dumitru St. This restaurant is named after Sergiu Malagamba, the Moldovan Jazz drummer from the 1940′s and if Malagamba were still alive, I feel he would be proud to lend his name to this new establishment. 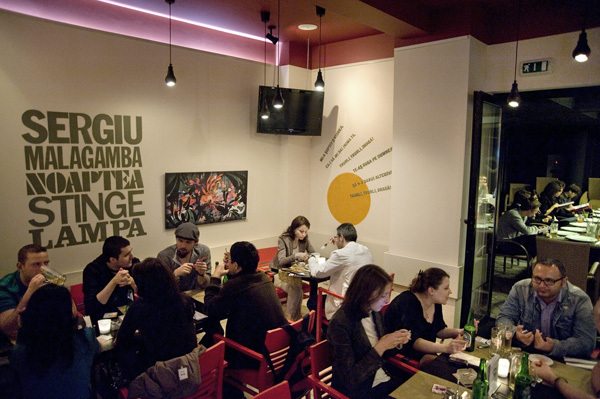 Located in Lipcani on Stefan Dumitru St., this place is nicely tucked away off the main thoroughfare. Since opening in March 2010, Irish restaurateur John McCarthy has managed to create a warm and friendly environment in this comfortable 50-seater restaurant where his team give service with a smile. Whilst having a leisurely lunch there recently, I couldn’t help noticing the clientele passing through. A high proportion of the customers were obviously regulars and well known to the staff. This is always a good sign and the very best of recommendations. It recognizes the quality of the service and the food and the appropriate pricing. European with a leaning towards Italian is the best way to describe the menu. The pasta is excellent, cooked al dente and served with one of a wide range of delicious home made sauces. In particular the truffle sauce is winner! Another personal favorite is the steak with pepper sauce, the beef coming from Romania. The wine list is extensive with a choice of 26 labels, Romanian wines plus others from around the world, Alsace to New Zealand to Argentina. The house wines by the glass are very good, recommended for lunch time when a bottle may be a little too much. The décor is simple inside, modern and clean with solid dark wooden tables and very comfortable arm chairs. On the walls there are interesting references to Malagamba. At the back of the restaurant there is a private function room. This would be an excellent space for a dinner party for 20 people. As you may gather from these words I like Malagamba and look forward to joining the band of regulars. Opening times: Midday until Midnight, everyday.